That morning, I met Fael in the pavillon, and we picked up our conversation. Pema Pera: btw, your bell here and the temple bell in RL next to where I live in Kyoto, are extremely well synchronized; at the hour they resound within seconds of each other! Pema Pera: perhaps the RL bell is connected with the internet as well? Pema Pera: Hi Stranger — nice name! Pema Pera: Stranger, come join us! Suddenly there were five of us, after Maxine, Steve and Stranger had walked in. Pema Pera: Stranger, have you been here before? Pema Pera: On the blog that I just mentioned, we also record our conversations. Pema Pera: Would you mind having our conversation quoted there? Pema Pera: Maxine, how are you doing? Fael brought up an important point. Fael Illyar: It just occurred to me that logging the conversations on the blog might be one reason these conversations are usually very civil. Pema Pera: interesting point, Fael! Pema Pera: pavilion warming party — hard with an open roof perhaps? 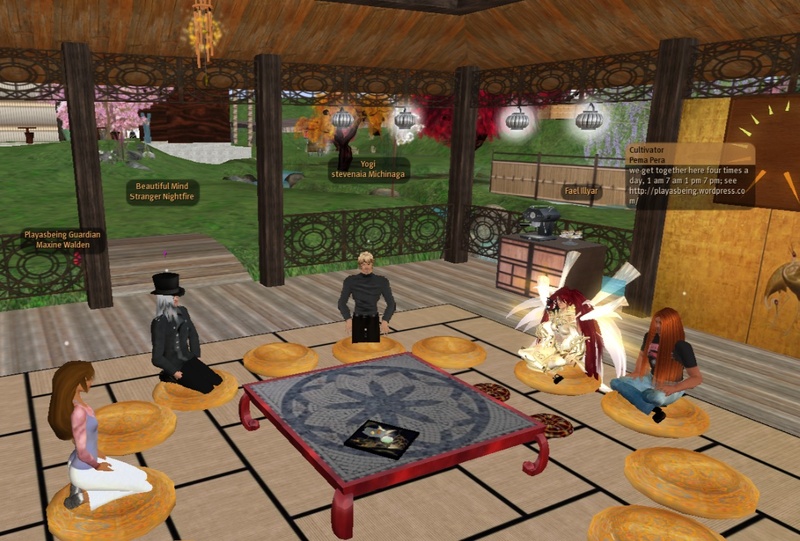 Pema Pera: Stranger, have you explored some other activities in Second Life, if I may ask? Fael Illyar: Stranger, we have a bell here that gongs every 15 minutes if you want to use it to try some explorations during the meeting. Pema Pera: Hi there, Sky! Sky joined us, so there were six of us now. Pema Pera: wow, you’ve really plunge in, great! Pema Pera: pretty wild place, isn’t it, SL ? Fael Illyar: also, this program can come in handy http://www.mindfulnessdc.org/mindfulclock.html if you want to try doing explorations more often. Sky Szimmer: is that more or less correct? Sky Szimmer: ah. but does it matter? I just love the movie analogy . . .
Pema Pera: yes, great question, and something around which there is always a lot of confusion! Fael Illyar: what do you think of the sentence “self has a motive, Being doesn’t”? Sky Szimmer: you are so precise! Pema Pera: but we tend to confuse the two . . . .
Alas, I had to leave. Pema Pera: well, within the relative realm, I now have to go to an astronomy meeting, even though time doesn’t exist . . . .
Pema Pera: Fael, would you mind sending me the log later? Pema Pera: By Sky, Max, Stranger, Steve, Fael! Sky Szimmer: you should change! Pema Pera: yes, if I ever find time to shop . . . .
Fael sent me the rest of the chat log; the comments are still mine. Fael Illyar: Sky, I remember thinking about that very same thing myself a couple of years back. Fael Illyar: took me a while to remember how I ended up resolving the question but the sentence I just said was pretty much what I got. Fael Illyar: I was initially mightily scared of the idea that if nothing is real, then what’s keeping me from doing things. Maxine Walden: as if there is no center of gravity within to hold one together? Sky Szimmer: what do you mean Maxine? Sky Szimmer: at least for me. Fael Illyar: anyway, my answer was basically that without self, Being will do nothing… although I wasn’t even aware of concept of Being back then. Maxine left, and Fael talked about a fascinating mathematics angle. Fael Illyar: The way I arrived into this is through math, actually. Sky Szimmer: Ah. That is great. Is that what you do? Fael Illyar: Well, yes and no. Fael Illyar: and if everything can be expressed by some number. Sky Szimmer: see you Steve. Steve took off, and Fael, Sky and Stranger continued the discussion. Sky Szimmer: is there really a back then as in time? Sky Szimmer: I think we can talk around some of it. Sky Szimmer: Yes. that is a hard one. Sky Szimmer: Hopefully, after a while, this word traps will be less hazardous. Fael Illyar: and keep that in mind whenever you’re reading words. Sky Szimmer: Hi Stranger. Like you name. Sky Szimmer: Is this your first time here? Sky Szimmer: How is it going for you? Sky Szimmer: what d’ya think? Sky Szimmer: I need to use that more. Fael Illyar: although, whenever I say that, there’s usually a thought saying “it’s interesting” hidden behind it. Sky Szimmer: the meetings here are held 4 x a day. don’t know if the others mentioned it to you. Sky Szimmer: there is a PaB blog if you are interested. Sky Szimmer: well. got to run. nice meeting you Stranger. Nice chatting with you Fael.